"Great light dressing to pair with cabbage or romaine lettuce, fresh mandarin oranges, and toasted almonds! Place greens in a bowl and add garnishes. 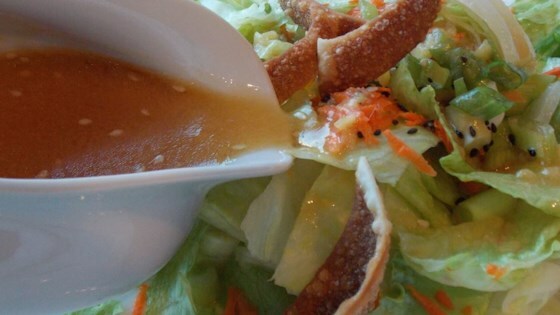 Ladle toasted sesame dressing around salad and toss to coat greens evenly. Sprinkle with 1 teaspoon toasted sesame seeds." This recipe is amazing! I just love it. I triple it so that it blends better in my Vitamix. I dont care for the ginger minced, prefer it much finer. This was easy to make and delicious. I am trying to replicate a dressing that I had at a restaurant, and this is not quite it, but it is still good, and I would make it again. Thanks! I make this often. I like to add juice from a a nice wedge of fresh lemon. It really makes the difference and tastes sweet and lighter. I didn't have any lime juice but will try that later too!